Steve, I love the Girls Spike It Better pattern. I have a Granddaughter who is a volley ball player. I'm a novice but intend to give it a try. Any chance of getting a pattern of this type for a Grandson who is a diver. 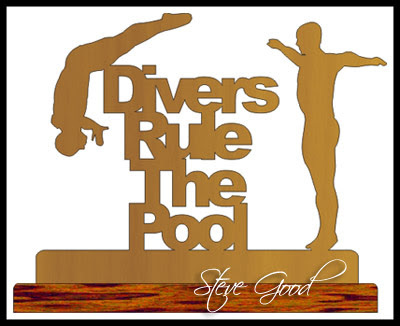 Thought it could say Divers Rule The Pool. Thanks for your consideration. Also please send your snail mail address. Hi Buckeye2, I like the slogan so here is a diving pattern for you.